Spine surgery is a common procedure performed in both elective and emergency scenarios. Over the last two decades, there have been a multitude of advances in surgical and anesthetic techniques that have improved patient safety and postoperative outcomes. The recent focus of anesthetic management for patients undergoing spine surgery is not only limited to successful perioperative assessment or intraoperative stability but also to rapid recovery and prevention of postoperative complications. In recent years, enhanced recovery after surgery (ERAS) programs have emerged within the specialty of spine surgery. These programs include a multidisciplinary, patient-focused approach along with multimodal analgesic strategies aimed at decreasing complications, relieving postoperative pain, and consequently hastening recovery and reducing length of stay. Although general anesthesia for spine surgery has been widely accepted, a new era of regional anesthesia brings growing evidence to supporting its use in lumbar spine surgery. Regional techniques have been associated with reduction in intraoperative blood loss, length of hospital stay, and incidence of postoperative nausea and vomiting. This recent evidence has provoked further discussion of this topic, and, to date, there is still no definite answer regarding optimal anesthesia for spine surgery. 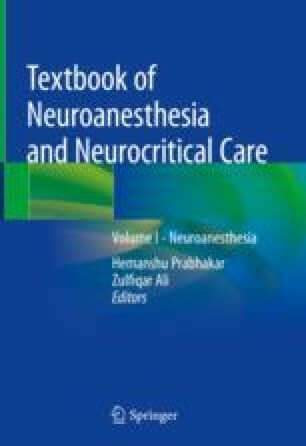 This chapter serves to summarize the available evidence on management of anesthesia for patients undergoing spine surgery.